Beautiful PGA West condo located on the 12th green of the Palmer Private Course. Beautiful kitchen including stainless steel appliances. TV's in every room. The master bedroom has a king size bed and the guest bedroom has a queen size bed. A very comfortable memory foam mattress sofa bed is in the den. The community pool and spa are located directly across the street. Available for short term and long term. 3 courses can be played at the resort and other courses nearby. This rental is the ideal desert get away! The house is impeccable and has everything you need - nice kitchen supplies, soft towels, comfortable beds, spacious bathrooms, laundry, BBQ. The patio has a beautiful view of the golf course with lounge chairs and a patio table. The pool is directly across the street from the house and the complex is clean and quite. Highly recommend staying here! Thank you for your kindness and the nice review. I appreciate renters who treat my home like their own. 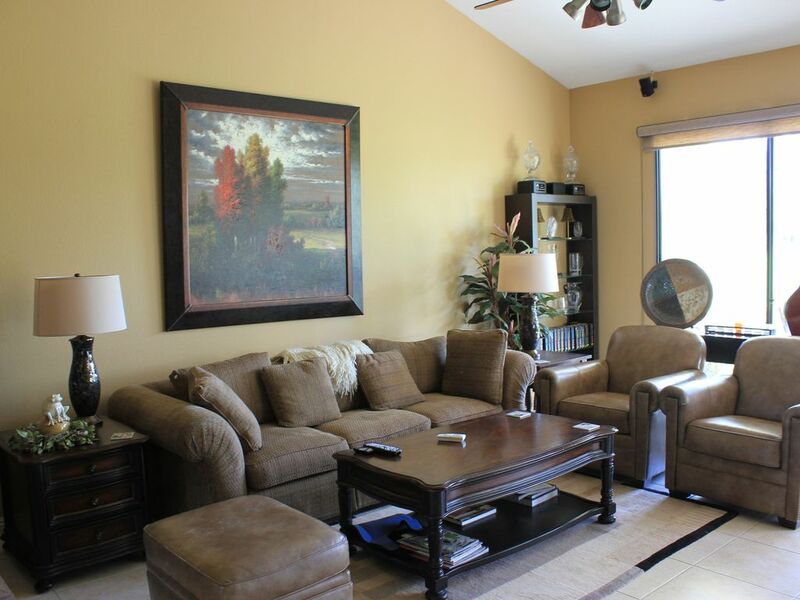 This home is lovely and everything a family could want or need for a relaxing time. The location is very quiet, great for watching golfers from the patio, and directly across the street from a beautiful pool/spa area. A large supply of linens and everything one could possibly want in a kitchen. The beds were very comfortable as well as the other furnishings. The mountain sheep visited us three mornings during the week, one brave enough to come right up to our dining room slider. Got some great pictures and videos. The owner was so gracious and helpful; we couldn't have asked for more in a perfect vacation. This property is definitely one of the best! It was a pleasure having Steve and Judy in my condo. They took care of it like if it was their own. Thank you. Our home for the winter. We loved staying at this condo. Our visit was January-March 31, 2018. The condo is very comfortable and well equipped. The pool is right across the street which was very handy for the grandkids. Had a few small maintenance issues that were fixed immediately. Manon is a pleasure to deal with and would highly recommend this property for rental short or long term. Thank you Pat and Bruce. It was a pleasure having you stay at my condo and taking such good care of it. I enjoyed meeting you and getting to know you. Immediately I was impressed with how immaculate everything was. Up to date, warm space was perfect. Homeowner always quick to respond, and made everything easy for us. Highly recommend this wonderful property. I did not get a chance to meet my guests but I enjoyed our communications. I hope they come back again. Thanks for the great review. Had an amazing time at this condo. I was here for stagecoach weekend with 3 other friends. It was about a 10 minute drive to the venue. It was very clean and roomy. The pool was right across the street which was nice. The owner is very nice and easy to reach. Definitely would recommend staying here! Had a fantastic time in this lovely condo. Super comfortable and homey right across from the pool. What more do you need.